Last season, the Albion Men’s Basketball program came away victorious in only nine of its 25 games. Through 19 games this season, the team has already posted 13 wins. The tremendous turnaround can be attributed to a newfound culture that surrounds the program, said junior forward Caden Ebeling of Shelby Township, Michigan. The dedication that each member has both on and off the court has lead to greater comradery. “We have a real strong sense of family here. We enjoy being around each other not just on the court but off it as well,” said Ebeling. Albion has a 6-2 record against Michigan Intercollegiate Athletic Association opponents so far this season. 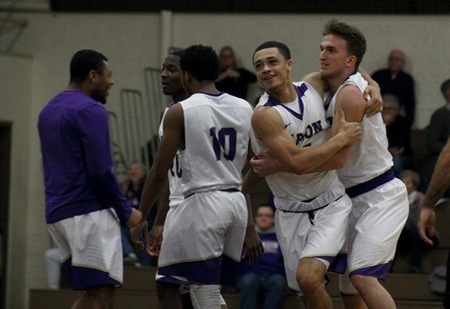 The Britons currently sit in second in the MIAA basketball standings with six league games remaining on the schedule. The top six teams in the conference advance to the championship tournament at the end of the regular season. The success that the team has had throughout conference play has been of no surprise to the coaching staff. The work that each player dedicated throughout the off-season is paying off at just the right time. This team has avoided consecutive losses so far this season. The ability to bounce back after a loss has helped the Britons’ confidence as they have played. Gill said senior leadership as well as the addition of younger talent has played an important role in maintaining this record. Four first-years have played on varsity this season. “We have some really good senior leadership this year. They are doing an unbelievable job understanding their roles and helping our younger guys come along faster,” Gill said. As the Britons get closer to post-season play, Ebeling is not overlooking anyone on the schedule. He says they must focus one game at a time as they work to achieve their goal of winning as many games as possible. “We really try to focus on one game at a time. We don’t talk about the [MIAA] tournament this year. We don’t talk about making it; we don’t talk about winning it; only thing we are talking about right now is beating our next opponent,” Gill reiterated. The Britons look for yet another MIAA win as they host sixth-seeded Alma College on Saturday, Feb. 2 at 3 p.m. JV plays Alma at 12:45 p.m.